Employees of Herman Miller and Mead Johnson Nutrition were among those who filled donated backpacks with school supplies for nearly 120 students heading to kindergarten. 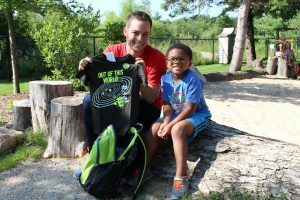 Herman Miller employees were among the volunteers who fanned out to meet soon-to-be kindergarten students on a sunny August morning to personally present each child with a bright green backpack. Inside each was an outfit of pants, shirt, and shoes, plus school supplies, such as a pencil box, crayons, colored pencils, scissors, and a folder. 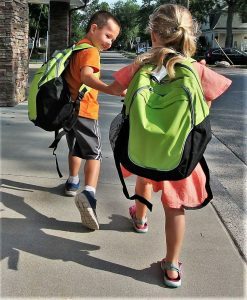 The backpacks offer a tangible expression of how the local non-profit organization Ready for School helps prepare students by giving them the tools they need for a strong start in school. “These things help to build that excitement for day one for somebody who might be a little bit nervous about starting this educational journey,” said Alison Freas, a former teacher who now works as the educational lead for the Herman Miller Cares Foundation. By helping build excitement for the first day of school, donated backpacks with clothing and school supplies are part of the Ready for School mission. Kindergarten readiness is a community issue. Herman Miller knew from the beginning that Ready for School was a wise long-term investment in solutions to carry children, families and our community forward. Science tells us that children’s first five years are when they develop the foundation for all future learning. A decade ago, the Zeeland furniture maker recognized the opportunity to level the playing field for children when their potential for brain building moments was at its strongest. 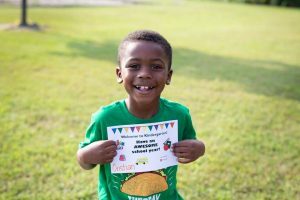 So Herman Miller was among the first of a dozen companies to begin supporting the community-led initiative that aimed to make sure more local children entered kindergarten prepared for success in school and life. By expanding access to high-quality early childhood education opportunities, companies were closing the achievement gap and supporting the earliest stage of the talent pipeline. “This was consistent with our belief that if we’re really going to create the workforce of the future, and we’re really going to take care of communities, it had to start with opportunities for the littlest of the little,” says Michael Ramirez, Herman Miller’s longtime executive vice president of people, places, and administration. Ramirez feels a personal commitment to the organization’s mission. He remained on the Ready for School board of directors even after stepping down from Herman Miller’s leadership team in early 2018. While volunteers were distributing backpacks, he and his wife Molly were busy setting up to grill and serve hotdogs for lunch. “We all know the studies say if kids aren’t taken care of wholistically by third grade, the chance of them being successful going forward is pretty tough,” Ramirez said. This summer, Herman Miller Cares and Zeeland neighbor Mead Johnson Nutrition each rallied their employees to fill donated backpacks with school supplies for nearly 120 Start School Ready students heading to kindergarten. A signature program of Ready for School, Start School Ready is a four-week “kindergarten bootcamp” that boosts children’s early literacy and social-emotional skills that equate to kindergarten readiness and sustained school success – aligning the pre-K and K-12 system.  Shandra Martinez serves on Ready for School’s Communications Committee. Shandra has been covering West Michigan since 1993 as a business reporter and writer.